Bhindi with mustard and poppy paste offers a original and tasty twist to a typical bhindi masala. Nigella seeds readily available in Indian stores] : 1 tsp. 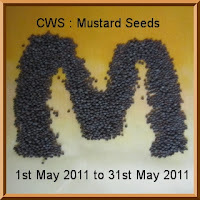 Yellow mustard seeds: 2 tbsp. Poppy seeds : 1 tbsp. Mustard Oil : 2 tbsp. that they are completely dry by the time I cook the vegetable.The more dry the okra, the less slimy it is while cooking. Cut the washed and dried okra in small round pieces and discard the top pointed tip and the bottom. Set aside. Now add mustard paste with 1/2 cup of water, green chillies, cook for 3-4 minutes till u see oil appearing on surface. Add the turmeric powder, sugar and salt, cover with lid. After about 6-8 minutes, remove the lid, and cook the okra till tender without the lid. Once about to be cooked, immiediately remove from heat. cracking,fry the okra, cook until 1/2 cooked watery, set aside. Serve warm with rice & lentils.